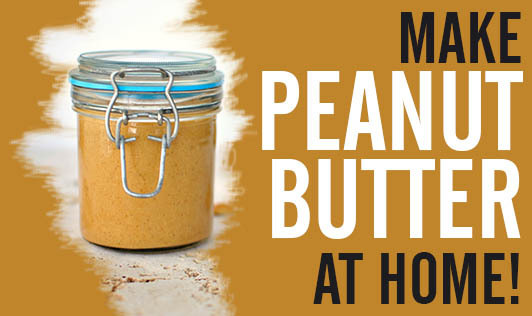 Make peanut butter at home! Peanut butter is a healthy and delicious snack which can be eaten as it is or used as a spread. There are many dessert recipes which use peanut butter. But, buying peanut butter regularly can be quite expensive. Making peanut butter at home is extremely simple and takes hardly 20 minutes. Here is the recipe for delicious peanut butter! • Roast the peanuts for 10-15 minutes. Remove the skin and let it cool. • Grind the peanuts with oil and salt in a food processor till it turns smooth. You will have to scrape down the mixture from the sides of the processor occasionally. • Store it in an air tight container and refrigerate for 2-3 days to set it. • You can add honey if you prefer a sweeter taste. • You can add broken peanuts to give it some crunch. • You can also add almonds while making the paste. So, say goodbye to the highly priced, commercially available peanut butter, and make your own!